Zadro Magnifying Mirrors have arrived. Happy Easter everyone its Debra again with this quick post to tell you the new models mentioned in my last post have arrived. All have been set up here on the site and ready to go. Three different versions to fit your every purpose from the magnifying mirror on a stand to the latest fogless shower mirror and let’s not forget compact lighted magnifying mirror that folds out. The LEDT01 from Zadro is not for everyone however for those looking for multi purpose compact then have a look at this model. It has two mirrors that you can look into at the same time with a different purpose. One surface being 10x magnification which you can get a lovely close up and the other 1x for a quick look to see everything is all in order. The best thing being you can switch on the light for one or both of the mirrors and it will fold out and sit on any surface. Day or night time compact for your handbag or use it as a travel mirror this one is the best there is. Our first sale went out the door before we even had time to post the LEDVPR410 Ultra Bright LED Next generation unit from Zadro such is its reputation. Large surface perfect halo light for your face and stylish as well. 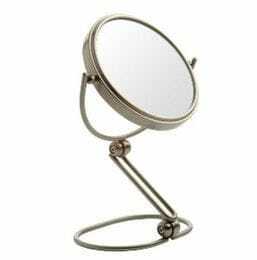 This vanity magnifying mirror is certainly worth your consideration. It comes with its own transformer and will plug into any power point and you can take it anywhere in the house. Finally the newest shower model from Zadro is the ZW20SS with unbreakable glass and a guarantee not to fog up. The process this mirror uses to prevent fogging is ingenious. Just lift the mirror off its base and allow the hot show water to run in the back of the mirror and hang it up again. The show water heats the mirror making it fogless in an instant. The polished stainless steel finish makes this unit very attractive so if you are in the market for fogless illuminated shower mirror then take a look at this unit. Well we hope you have a great week as for me its time to get busy - I'll be writing a detailed version of the new products so you can make an informed decision. 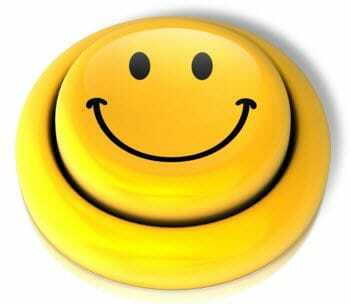 As always don't forget to smile! Hi everyone its Debra again after a long break. We hope you had a great Christmas and New Year break. During the year we received many enquiries do we carry the Zadro range of products and I’m pleased to say we have been carrying this range since inception. Today I have added the Zadro logo to the blog as a way of letting you know and making it a little more obvious that we carry many of their product lines from magnifying mirrors to UV disinfection sanitizing lines. With the next shipment due in March My Health and Beauty plans to add even more lines .One of the new lines available will be a new shaving mirror for use inside the shower the stainless steel ZW20SS break resistant mirror The mirror has a patented built-in reservoir which heats the mirror surface, keeping it fogless even in the hottest and steamiest showers. Dermatologists all over the world recommend shaving, cleansing, and exfoliating skin in the shower to receive the best results. The heat and humidity from a hot shower opens pores and soften hair follicles. This allows razors to more easily and closely shave away the hair, while avoiding painful tugging, pulling, and razor burn. This mirror will already compliment the Zadro Z850 adjustable 1x to 5x magnifying mirror on the site. 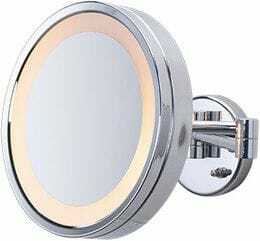 We have also added the new Ultra Bright LED bathroom vanity magnifying mirror the LEDVPR410. This will expand on the popular NGLED410 also from Zadro found on the site. This bathroom vanity magnifying mirror lights up with energy-saving, super bright LED bulbs that illuminate your entire face, allowing you to see the finest details in even the dimmest lighting! We all carry a compact mirror around in the handbag to ensure we look our best; however it’s very annoying at night or even early evening where you may not get the opportunity to use a light.The next shipment will also carry the LEDT01 a lighted travel mirror that offers a compact design with the functionality of two application mirrors that can be set in position and you can use the both at the same time. No hands needed just set in position turn the light on and everything becomes very easy especially when you’re on the run. It features two LED lighted magnifying mirrors that collapse into a sleek and compact size ready to put back in your bag. Zadro design style and patent many of their products so you know the quality just has to be there. We’ve not seen any other mirror range that has the affordable style of the Zadro range. Have a look see what you think you won't be disappointed. Until next time smile and have great week. I thought today we could cover a little about a mirror that seems to have been around for a long time and also copied by many the 2028c scissor arm magnifying mirror. Always popular with it seems an unlikely timeless design. This design reminds us or prompts us to think it’s a mirror you would expect to see in an old hotel in the early 1900s or the local barber shop. The distinctive feature is the scissor arm which extends the magnifying mirror out from the wall. Having looked at our full range of mirrors I believe it this wall mount mirror will extend out 60cm from the wall which is further than any model on the market – apart from the copies out there. If anyone has purchased a copy from overseas then they soon find out the wall bracket that supports the mirror does not have sufficient strength. Our 2028C wall mount magnifying mirror is of the highest quality with more than enough strength to allow the mirror to extend 60cm and swing from left to right 180 degrees. This mirror itself is double sided and by turning the mirror you can have either 4x magnification for close up attention or 1x to see that all is in order before you walk out the door. As always I like to give you the space requirement for the scissor arm magnifying mirror so you can plan the best place to put it. As we know all bathrooms are very different hence the versatility of the scissor arm. This mirror will fold back flat against the wall so its neat and tidy the dimensions are as follows with the unit folded back into the smallest possible configuration 41cm high and 23.5cm. Meaning these are it’s highest and widest points. Mounting this scissor arm magnifying mirror on the wall is the easiest of all with two screws provided, they should be screwed directly into timber located behind the plaster or if you have a tiled surface then drill the holes and put plastic plugs in then screw your screws into the plugs. When looking over the website whilst the image is fairly obvious its best to look at the code with the numbers 2028 mean the mirror the C stands for chrome and this mirror is available in G so it will have a G after the code. Both models are made from steel and the surfaces Chrome or Gold are a plated finish. Because we have had enquiries I need to remind you do not mount the mirror inside the shower cubicle. The mirror is real glass and can shatter easily should hot water hit the surface or if you slip and grab for the mirror on instinct it can be very dangerous. Broken glass inside a shower cubicle can result in a nasty cut. Also the metal scissor arm will rust. Chrome, Gold, or Brass plating will not prevent steel from rusting when they get wet with shower water everyday. 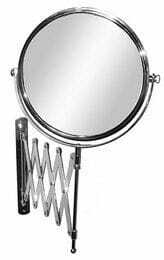 The 2028 Scissor Arm magnifying mirror is a quality buy and should last a lifetime.